This selected bibliography is designed to assist New York Medical College students and others to write scholarly research papers and /or theses and should supplement the School’s official thesis preparation guidelines. Please make sure to understand the official Guidelines for Preparing the Master’s Thesis for the School of Public Health and for the School of Basic Medical Sciences. Most of the resources in this guide were selected form the Health Sciences Library’s collection and are available to use. Please contact Judy Gitlin at judith_gitlin@nymc.edu for questions, comments, and suggestions. The 10th edition of the AMA Manual of Style, published in early 2007, brings this definitive manual into the 21st century with a broadened international perspective. In doing so, the 10th edition has expanded its electronic guidelines, with the understanding that authors now routinely submit articles through online systems and often cite Web-only content. Ethical and legal issues receive increased attention, with detailed guidelines on authorship, conflicts of interest, scientific misconduct, intellectual property, and the protection of individuals' rights in scientific research and publication. The new edition examines research ethics and editorial independence and features new material on indexing and searching as well as medical nomenclature. 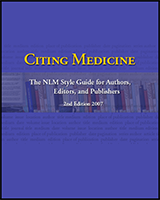 Citing Medicine: The NLM Style Guide for Authors, Editors, and Publishers by Karen Patrias; Dan Wendling, Technical Editor. International Committee of Medical Journal Editors. (Updated 2006, February). Uniform requirements for manuscripts submitted to biomedical journals. The most trusted and authoritative name in handbooks, The Little, Brown Compact Handbook is an easy-to-use reference that will answer any question you may have in grammar, writing, or research. This edition offers the latest information on writing with computers, writing online, analyzing visuals, and researching effectively on the Internet. With clear explanations, a wealth of examples, and quick reference checklists and boxes, The Little, Brown Compact Handbook will makes it easy to find what you need and use the information you find.